For 1968 Mustang parts changes were varied. After a major restyling, body parts, engine choices and many small items were changed. Although at a glance, these classic Mustangs looked almost the same as their early brothers, improvements and size increases added new parts to the mix. Although the focus of this section, is primarily new parts for restoration or rebuilding and cool stuff to dress up or improve performance, remember that used parts for some applications of your 68 Mustang rebuilding project, can be a bonus. We don't always think of tires,when we think of parts for our pony cars, but finding the right size and width in a modern tire to match the oem sizes are important if you are restoring your car to look original. The tires from the Ford factory in 1968 included the Firestone wide oval and the Goodyear Polyglas tires. Note: If you are looking for original style bias belted tires, check out Coker Tires. They make original styles and designs including white wall tires in the correct white wall thickness. Prices are reasonable too. For 1968 cars, assuming you want the handling and ride benefits of a modern radial tire, I'd recommend something along the lines of between a 195/78/14 and a 205/78/14. These sizes approximate the original width and profiles. The perfect gift for any auto enthusiast: The perfect gift for any auto enthusiast: A gift certificate from Tire Rack. Particularly nice if that special someone is facing snowy, frozen conditions or wet winter monsoons (like where I live). Replacement engines and rebuilding parts are common things you'll need in your restoration project. In my case, I had the original intake manifold and a parts missing original carb. So it seemed a good time to upgrade to a new edelbrock manifold and a Holley 600 cfm carburetor. Then I realized that as soon as the old intake came off, a new gasket was going to be needed for the new intake and a new carb gasket, and linkage adapter to make the new 4 barrel carburetor adapt to the original throttle linkage! Oh well, if I hadn't wanted a project car, I'd have been paying someone for the privilege of buying and installing them any way. There are a number of good aftermarket classic Mustang parts sellers. Many of these companies have been around more than 10 years. 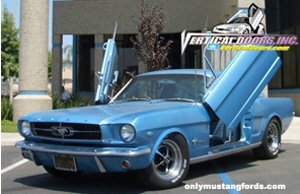 Some of the most popular (in no particular order) are CJ pony parts, Kentucky Mustang, Dallas Mustang, Tony Branda and others. Particularly for 1965-1968 Mustangs, there are vast choices in doors, hoods, trunk lids, spoilers, floor pans, grilles and even bumpers. In fact for chrome items, unless you are looking for NOS (new old stock) parts because you plan to show your car and want the most authentic pieces possible, virtually every part you could want is available in reproduction at very reasonable prices.